Even as Mitt Romney pivots to face President Barack Obama in the general election, the sudden resignation of spokesman Richard Grenell shows his far right flank will continue to make itself heard throughout November. The Washington Post reported Tuesday that Grenell, who is openly gay, resigned after the Romney campaign was hectored by social conservatives for hiring him. 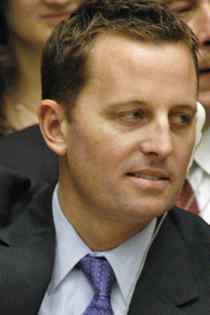 The Post cited sources who said Grenell quit after he was “kept under wraps” when the anniversary of Osama bin Laden's death made national security a main campaign issue. Former White House spokesman Ari Fleischer, President George W. Bush's press liaison during the September 11, 2001, terrorist attacks and the invasion of Iraq in 2003, also questioned why Grenell wasn't used prominently when foreign policy was front and center. Grenell, of course, didn't help himself by tweeting insulting comments about Secretary of State Hillary Rodham Clinton and Callista Gingrich, among other women, before joining Team Romney. The far right wasn't exactly in love with Romney during the Republican primaries, and the Grenell saga shows that his campaign hasn't yet figured out how it will work with arch-conservatives as it adjusts its message for the general election.